Task Jeannie App is a smart and simple solutions to manage everyday Tasks. This App enables User to Define and Customized their Tasks and according to it, User can create a Schedule for their jobs. This will reduce the friction in between Time Limit and Work Pressure. 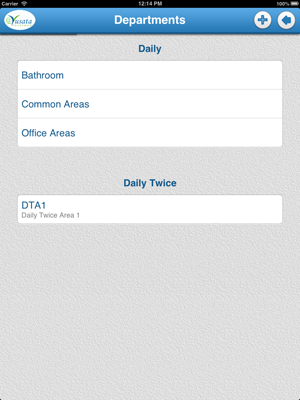 This App provides User a facility to save the time and increase their work Productivity. • By Tapping on Task Activities Icon on Home Menu will navigate to Task Activities Screen ,where User can see the list of All Tasks which also can be categorized by Selected Department. 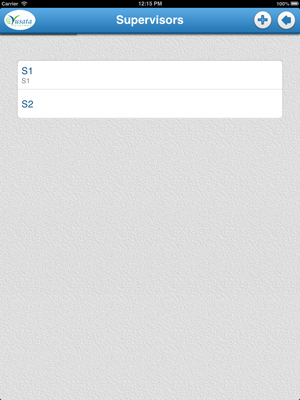 a)Tapping on Cleaner Icon will show Cleaning Details Screen,where User can fill and Save their Task Details. 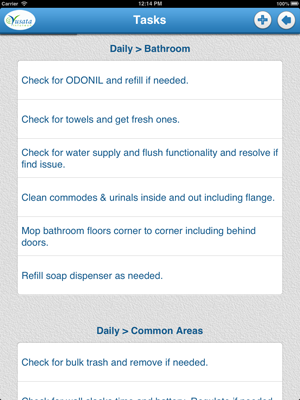 Updated Task List is easy to understand and manageable. - Task pending ,annotated by White color. - Task done by User ,annotated by Yellow color. - Task supervised by Supervisor ,annotated by Green color. b)Tapping on Calendar Icon located on Header Strip, User can see the Task list for specific date using Calendar's Previous or Next Button. 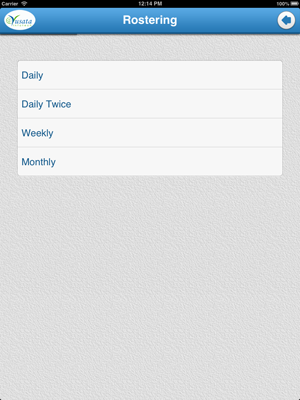 c)Tapping on Report Icon located on Header Strip will show Daily Logs Screen, where User can see Report for different Tasks and Activities with all details.Here, User is able to generate a log Report for Different Date by selecting the Date using Calendar's Previous or Next Button and able to Mail or Print that pdf report. • By Tapping on Configuration Icon on Home Menu will navigate to Configuration Screen,where User can configure their Tasks and related informations. • By Tapping on Rostering Icon on Configuration Screen will show the List of Rostering. 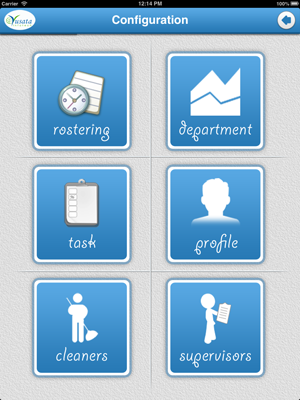 • By Tapping on Department Icon on Configuration Screen will show the List of Departments. a)Tapping on Add sign located on Header Strip will show Add Area Screen or Pop-Up Box , where User can add new Department in selected Category. b)Tapping individual Department Name will show Edit and Delete Icons and User is able to Update and Delete informations of selected Department. 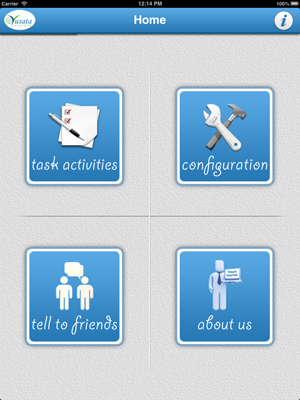 • By Tapping on Task Icon on Configuration Screen will show the List of Different Tasks. a)Tapping on Add sign located on Header Strip will show Add Task Screen or Pop-Up Box , where User can add new Task in selected Category and Department. b)Tapping individual Task Name will show Edit and Delete Icons and User is able to Update and Delete informations of selected Task. 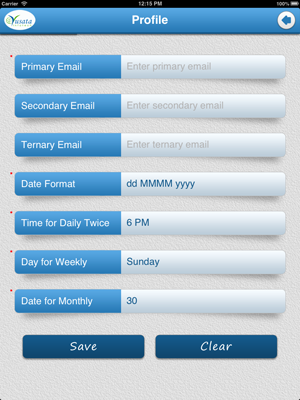 • By Tapping on Profile Icon on Configuration Screen will show Profile Screen where different E-mails can be set to send email daily.The Date Format, Time for Daily Twice and Date for Monthly, User can set their values and able to save specific Profile. • By Tapping on Cleaners Icon on Configuration Screen will show the List of all Cleaners/workers. a)Tapping on Add sign located on Header Strip will show Add Cleaner Screen , where User can add new Cleaner Name and Description. b)Tapping individual Cleaner Name will show Edit and Delete Icons and User is able to Update and Delete informations of selected Cleaner. • By Tapping on Supervisors Icon on Configuration Screen will show the List of all Supervisors. a)Tapping on Add sign located on Header Strip will show Add Supervisor Screen , where User can add new Supervisor Name and Description. b)Tapping individual Supervisor Name will show Edit and Delete Icons and User is able to Update and Delete informations of selected Supervisor. 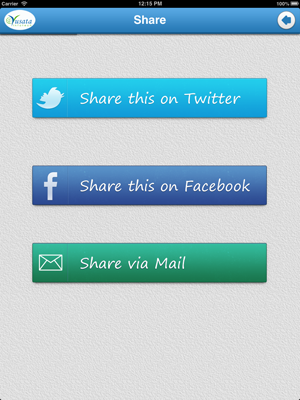 • Tell To Friends Icon on Home Menu will navigate to Share Screen, where User can share this App with his/her Friends via Twitter, Facebook and Mail. 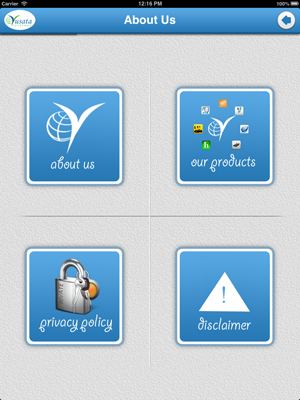 • About Us Icon on Home Menu will navigate to About Us Screen, where User can get the Informations about Yusata Infotech, T&C, Privacy Policies and Company's other Product List. Home screen of the application where user will see the functional buttons and the info button on top right. 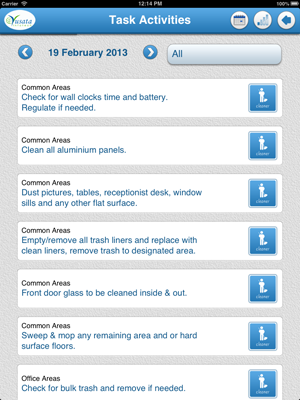 Task activities screen of the app where user can see the tasks and enter the details about cleaning. 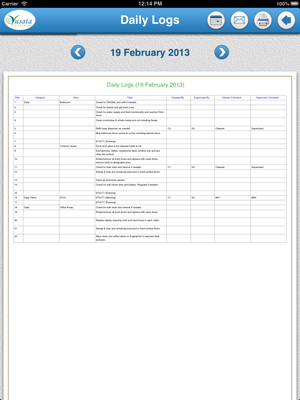 Daily logs screen where user can see the report on the status, done by, supervised by and their corresponding comments for the tasks. Configuration screen where user can configure rostering, departments, tasks, cleaners, supervisors and the user profile. Rostering screen show the list of rostering available for the tasks. Departments screen show the lists of the departments according to its rostering. Here user can also add, update or delete departments from this screen. Tasks screen show the lists of tasks according to its rostering and departments. User can also add update or delete tasks from this screen. Profile screen where user can configure his/her profile for the application. Cleaner screen shows the list of cleaners. The user can also add, update or delete cleaners using this screen. Supervisor screen shows the list of supervisors. User can also add, update or delete supervisors using this screen. Share screen used to share about the application using twitter, facebook or email.